Archie Bunker is such a well-known American character, most people probably don't realize that he was based on a character from a British TV series. 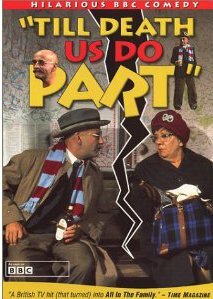 Till Death Us Do Part tells the story of Alf Garrett, his wife Else, daughter Rita and Rita's liberal layabout husband Mike. Alf is quick to express his opinions to everyone, blaming politicians (especially liberal ones) for the problems in the country, and expressing his disdain for people who are unlike him in skin color or national origin. Most people in the three episodes I saw seem to stand and listen to his rants in a somewhat shocked manner, without attempting to argue or set him straight. He does have frequent ideological arguments with his son-in-law Mike (played by Antony Booth, Cherie Blair's father), who seems to spend most of his time lying on the couch with a book. In the episodes I saw, there was never any mention of Mike working. Alf's long suffering wife Else also argues with him, but Alf is (to say the least) stringent in his opinions. In one of the episodes, Alf and Else enjoy a holiday at the seaside in Bournemouth. Looks relaxing, doesn't it? Since this series was filmed in the early 1970s, most of the references to politicians and political situations are unfamiliar to me. Still, it wouldn't matter who was in charge. I get the feeling that Alf would have plenty to say, no matter who was running the country. One thing that is very shocking to modern viewers is the near constant smoking by Else. She is often seen with a smoldering cigarette, ash dangling, as she holds her infant grandson. That's something you wouldn't see in a modern sitcom! All in all, the series in enjoyable (in brief doses) for the over-the-top antics of Alf. Still, a lot of drunken yelling goes a long way, so I wouldn't recommend watching many of these episodes in a row! Archie and Edith are probably looking pretty out of date by today's standards, too!